Out of the seven wonders of the ancient world, the only one remaining is the Great Pyramid of Giza in Egypt. If you are wondering what happened to the other wonders, they were destroyed by fire and earthquakes. Wonderful. I have never been to the Great Pyramid of Giza, but I plan to before I die. 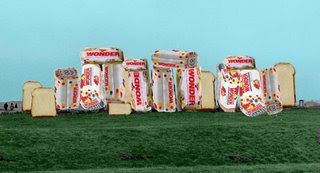 I have been to Stonehenge on the Salisbury Plains of England, but it isn't on the list. I liked it anyway (even though you couldn't actually walk up and touch the stones or scratch your name into them...the British are picky about things like that...and you have to walk through a gift shop get to it...I bought a t-shirt). I have been to the top of the Empire State Building in New York City. It is considered one of the modern wonders of the world (and I did spend a long time in line wondering how long it would take me to get to the top). I have also seen and crossed the Golden Gate Bridge in San Francisco. It is also considered one of the modern wonders of the world. I have seen the Reno Arch...the new one and the old one. I have also walked by the Reno World Bowling Convention Center. It is shaped like a bowling ball. I've been to Philadephia and seen the Liberty Bell, Independence Hall and the house Betsy Ross lived in (she didn't really sew the first United States flag). I've also seen the steps Rocky Balboa runs up in the Rocky movies. And just for the record, Philly Steak Sandwiches are made with Cheese Whiz and fat. I've been to Boston and visited the bar that inspired Cheers. Oh, I also saw the Old North Church and Paul Revere's grave. I've been to the Anchor Bar in Buffalo, New York. It is where Buffalo Wings were created. I've driven past a gas station shaped like a tea pot off of Highway 82 in Zillah, Washington. It was built in 1922 in protest of the "Teapot Dome Scandal." The real Teapot Dome is a rock formation in Wyoming. I held Poppy, a baby alligator at Everglades World outside of Miami. I didn't buy a t-shirt commemorating that event, however (they wanted $25). I've been to the MAUNA LOA MACADAMIA VISITOR CENTER in Hilo, Hawaii (you have to grab your samples quick before the senior buses arrive...old people can be pretty pushy). Hilo is also proud home to a Walmart our tour guide pointed out. I have never seen the Great Wall of China, the Grand Canyon, the Taj Mahal, the Leaning Tower of Pisa, the Eifel Tower, the Panama Canal, the Great Barrier Reef, Mount Everest, Mount Rushmore, Rio de Janeiro, Macchu Picchu, Niagra Falls, the Galapagos or Graceland. So unlike Johnny Cash, I haven't been everywhere. But I have been to Disneyland, Disney World and Las Vegas, so that makes up for a lot. I have been there and back and believe me, T, it's been a trip because as you know, you can't there from here. You are a true nowhere man. Oh yea? Well, I've been to (CLASSIFIED), (CENSORED), and (TOP SECRET), so there! 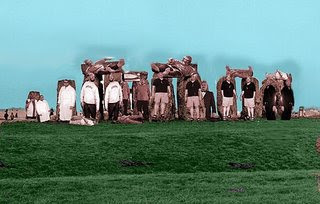 humm, you went to Stonehenge and got the t-shirt. I come back with the shot glasses. there is a crucial difference here somewhere....if I could only put my finger on it. maybe if I refill the glass it'll come to me. Quite an impressive list. It must have been great fun. Thanks to you, I woke up singing that damn song and I still can't get it out of my head. Burger in paradise "Margarittaville" in the keys. Chigago dog in where else... Chicago. Tacos and a margaritas in Ensenada. Chips and Bailey's in Ireland. I haven't been everywhere YET. If I do go, they better have good food. So are you saying I'm making all these nowhere plans for nobody? We have established you have lived in the south, Alaska, underwater and Jacksonville. We'll catch up with you eventually. You got a SHOTGLASS? Wanna trade? Lights, I was more impressed with where I haven't been. Shandi, Johnny Cash music grows on you much like a foot fungis. It is the food we look for when we travel. I did have a cheeseburger in paradise at the Le Select cafe in St. Barts. Supposedly that is really where Jimmy Buffet wrote the song.